We had enjoyed a busy morning tasting wines in the Northern Rhône, and before lunch we made our way to the edge of Tain l’Hermitage to taste and buy some reasonably-priced wines at the town’s wine cooperative. One of the biggest and best wine cooperatives in France, Cave Cooperative de Tain l’Hermitage accounts for 70% of the total Crozes-Hermitage produced and 30% of Hermitage. They also produce a range of other wines from the northern Rhône with several cuvées for each appellation, some only available in situ. Their tasting room and shop is open every day with a short break for lunch, and we could choose from a nicely presented selection of good wines which included some older vintages. Recently the Cooperative has opened a visitor centre for groups, Fief de Gambert, on their Gambert de Loche estate on the vineyard-clad hill of Hermitage and only a short way out of town. And in the building there is a fine little restaurant, Umia, run by an enterprising young couple, Rika and Frédéric Bau. It was winter and although there was only us and one other table, we were charmingly looked after by the young waiter who enjoyed telling us about his season in the Lake District in northern England, having first described the menu to us. We were tempted by the main set menu, Secrets de Goût, four courses for €38 or €58 with three glasses of wine from the Cave de Tain l’Hermitage. However with a busy afternoon in prospect we decided to have the lighter menu, Umia Express – two courses, a café gourmand and a glass of wine for €23.50. The first course was an attractively dressed salad with walnut cream and chiffonade of ham which was well accompanied by a white Crozes-Hermitage made with Marsanne and Roussanne. Next, the red Saint Joseph with its peppery Syrah notes was fine and dandy with the confit of duck on creamed potato and fennel, cooked in orange juice. Then came the surprise. The coffee came with more than a Valrhona chocolate! As well as a little chocolate mousse, there was a little pouding and a couple of pieces of marinaded pineapple, much more than we expected with our espresso. 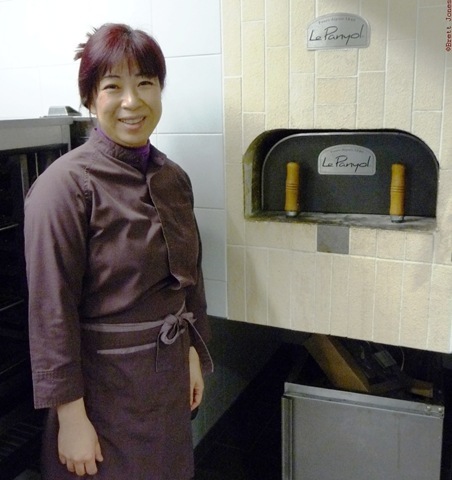 When we had paid our reasonable bill we were invited to visit the kitchen – the spotless kitchen – where we met Rika Bau who proudly showed off her wood oven, manufactured locally. Umia is heartily endorsed by Paul Bocuse and is very much part of the local vinous community, with a wall encouraging the local vignerons to add their comments and secrets. It is a great place to pause for a meal, be it the full monty or the speedy express menu, and is deservedly recommended by Rhône specialist writer John Wheeldon on Wine Travel Guides. This entry was posted on Saturday, March 20th, 2010 at 6:38 pm and is filed under Places to Stay, Eat and Shop, Vineyard Visits, Wine Tourism General. You can follow any responses to this entry through the RSS 2.0 feed. Both comments and pings are currently closed.